I have yet to meet a child that doesn’t love animals. Farm animals, zoo animals, and household pets are all intriguing for kids of all ages. 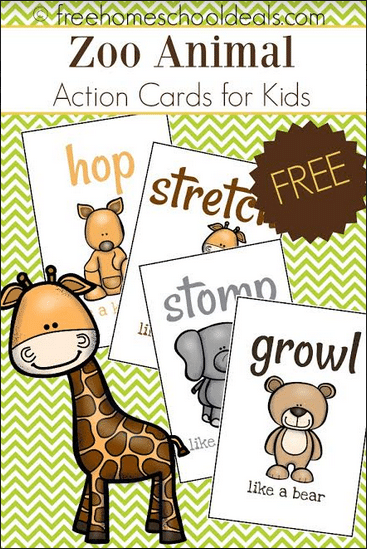 Incorporate some movement into your animal studies with these fun zoo animal action cards. Kids will have fun identifying each of the animals as well as mimicking their movements. I like to print these types of cards out and put them on a keychain ring so little hands can “read” them. This is a great way to introduce and reinforce reading and animal identification. This set of zoo animal action cards introduces preschoolers to nine animals commonly found at the zoo. Print them out on cardstock for stability, and laminate them for stability.